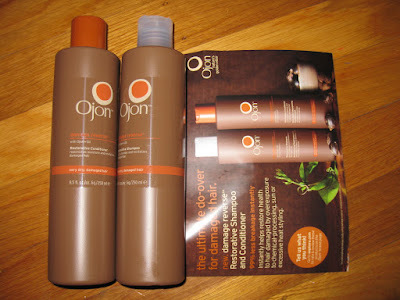 Kalifornia Love: Did anyone get the Ojon shampoo/conditioner from Sephora yesterday? Did anyone get the Ojon shampoo/conditioner from Sephora yesterday? I was so excited to post about the Ojon shampoo/conditioner offer over at Sephora yesterday but when I tried to log on, Blogger was down! And I tried throughout the day and it was down all through late morning until the time I went to bed. =\ Anyways, at certain locations, they were giving away free full size bottles of Ojon shampoo and conditioner if you brought in one empty shampoo or conditioner bottle from any brand. If your local store was offering this, I hope you got the set! I went to my sephora and they told me it wasn't at that sephora. They gave me a list, but all were too far. I was so upset I had to console myself by buying some MAC. Aww! =( At least you got your MAC on. What did you get? @ Rinz.. Okiedok will do. Haven't tried it yet because I have like 5 shampoo/condtioner bottles in the shower that I need to finish! P.S. I checked a few days after this deal and it was still there! It wouldn't hurt to call your local Sephora. @ Kristine N.. Aww. =( That's a bummer. Hopefully you get something really awesome next time.